Photo by Dan Perry under Creative Commons License. Attention all cold weather golfers! This one may bring a warm smile to your face. Stop and think for just a moment. Do you ever wish that the weather would just stay warm enough to play just one more game? Do you frown when the weather gets so cold that it is difficult to grip your club the way you want? Did you answer yes to either one or both of these questions? Awesome! Now before you go hunting for the perfect place to play some winter rounds, stick around for a few more minutes. Here is one more question for you to consider. Has your family wanted to take a vacation this year? Believe it or not there is a place you can quench your taste for some winter links and their taste for a vacation at the same time. Where you may ask? 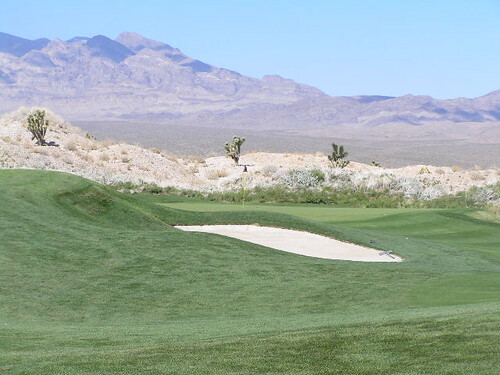 The Las Vegas golf club may be just the place you are looking for. As you continue to read here are a few things to keep in mind. The first of which may be the most important factor, the temperature. It only makes sense that if you are going to play golf in the winter; you want to stay warm while you do so. The average day time high in November ranges from the sixties into the mid-seventies. Many of you will probably agree the warm desert air will feel a lot nicer on your skin than the average temperatures where you live. That’s not to say you will not to pack a jacket on this vacation. Whether you are going alone or bringing your family along for the journey make sure you pack smart. While the day time highs will be in a very comfortable range, it certainly cools off at night. The average low in Sin City in November ranges from the forties into the fifties. Does the thought of spending the December holidays in Vegas appeal more to you then the November ones? You may need to consider bringing a little heavier jacket with you, but December may still work for you. The average day time high tops out around the upper fifties. The low at night though may feel more like home then you were hoping for. They are usually somewhere in the 30s. Regardless of when you and yours decide to visit Sin City there will be plenty of adventures in store for everybody at locations like the Las Vegas golf club. The golfer(s) in the group can also keep track of important information using the Golf Finder app for their Apple Products.